From the moment we first spoke with Lara, we knew she had an amazing and unique vision. Not only did she want a unique color palette, she was also interested in using fragrant flowers, herbs and citrus to add to the scent memory of her day. In her florals, we used peony, mock orange, ranunculus, scabiosa, lisianthus, euphorbia, fox glove, tweedia, delphinium, garden roses, rosemary, lavender, and sage. We also decorated the tables with pomegranate, kumquat, and clementines. Lara worked closely with Dee Hutton to design her beautiful dress. Look at that train! The grandeur of dress fit perfectly with the dramatic interior of Duke Chapel. Lara also did not overlook any details at her reception. 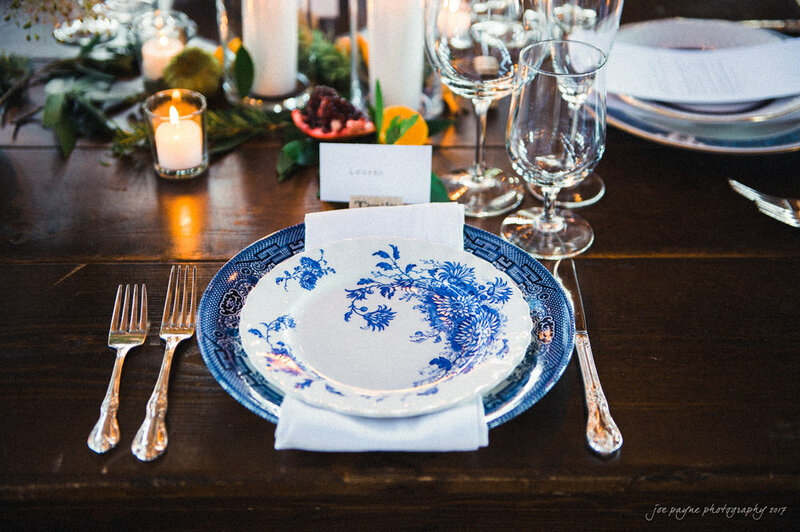 She sourced hundreds of beautiful blue and white china dinner plates from Southern Vintage in Georgia. Lara's love for tropical plants was also the inspiration behind the tropical photo backdrop! We are grateful for how well Joe Payne Photography captured all of the details!